Have you ever meet this issue,one of your chair caster broken or missing but the chair still very good,it is waste to throw away.Now you can using ZOTO Chair Replacement Wheels to solve this problem. FLOOR PROTECTION -- Zoto soft polyurethane chair casters protect your hardwood floor,carpet without any marks and scratches. SMOOTH AND QUITE ROLLING -- Twin wheel design keep super quite and smooth rolling,no noise when rolling,won't disturb anyone while working. UNIVERSAL STANDARD SIZE --11mm*22mm universal standard stem size fits all office chair bases with 7/16" industry standard mounting holes. 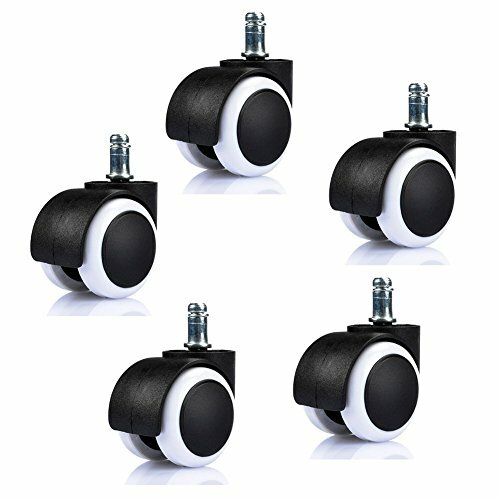 EASILY INSTALL --Simply pull out your current casters down and push in ZOTO chair replacement wheels into the socket, then start enjoy your comfortable working time. If you have any questions about this product by ZOTO, contact us by completing and submitting the form below. If you are looking for a specif part number, please include it with your message.